Well, this was a cruise that was totally unplanned. Our big cruise was supposed to happen back in the Spring and it was supposed to have been on the Mariner of the Seas out of Florida to the eastern Caribbean... but alas, that cruise had to be cancelled due to a prolonged injury/illness that left me unable to work through most of the winter of '06-'07. 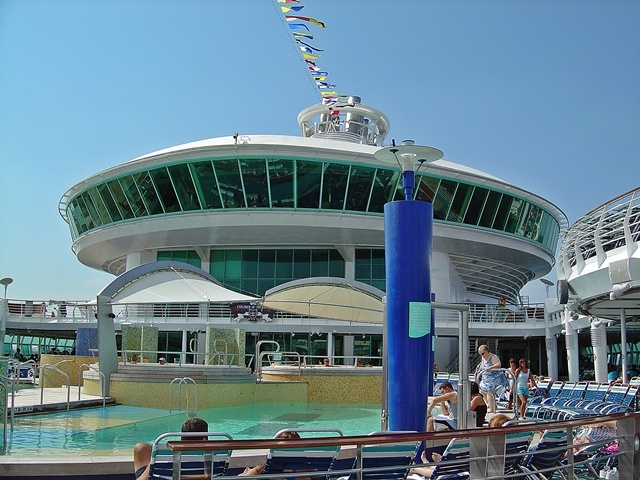 So, we had to cancel that cruise (gasp!). 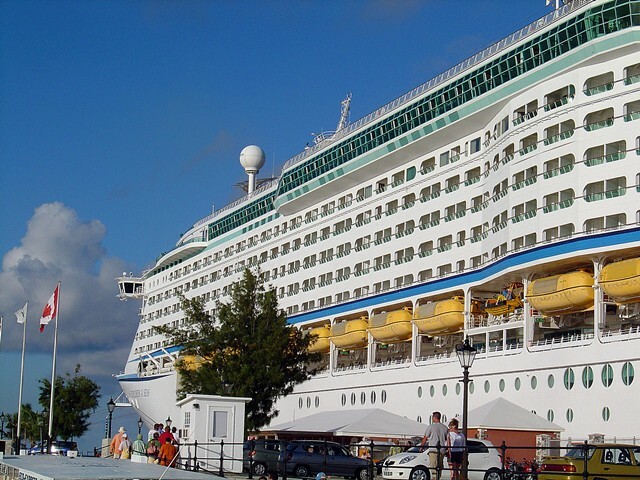 But, being the cruise addicts that we are, we had to do something... so we decided on the infinitely affordable and incredibly excellent five night Explorer of the Seas trip to Bermuda once again. Almost exactly one year to the day we were off once again to Cape Liberty in Bayonne, NJ. This time we were accompanied by our dear friends and always wonderful cruise companions, Kim and Steve. We were in adjacent balcony cabins... ours was 8586 and they were in 8588. 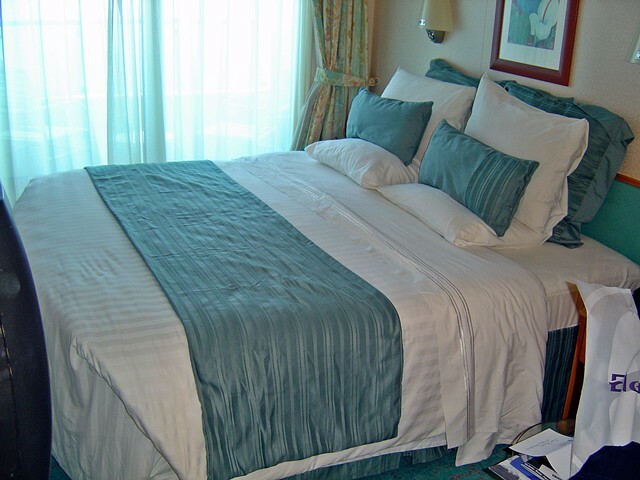 I am very pleased to announce that Explorer now has the enhanced linen and mattresses that we enjoyed so much on Freedom of the Seas last year. These weren't in place on our Explorer sailing last year. This is an excellent change from the old dressed up cots that cruise ships used to employ. Our cabin steward was Geraldo (Gerry) Gonzales... he was truly amazing and funny and above and beyond in performing his duties. Just about every time I approached my cabin, he would come out of nowhere and open the door for me! As is typical on RCCL, our cabin was always immaculate. Bed with an ocean view! Excellent new mattresses and linens! 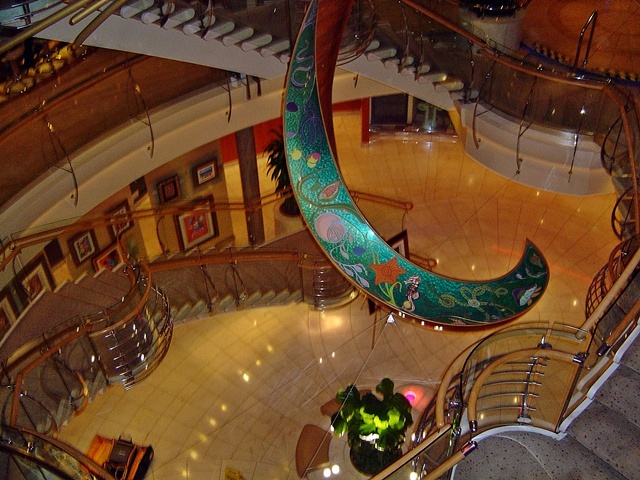 Staircase down to deck 3... beautiful art all around! Embarkation day was the typical hubbub at Cape Liberty... each year it improves a wee bit. I can't wait to see it's final realization. This year, parking was on the other side of the port building. We used to skip luggage drop off and turn into parking right away. Now you must pass in front of luggage drop off to get to parking. It makes it much easier for those that like to drop off their luggage first. Since ours is spinner wheeled luggage, we don't mind wheeling it over from the new parking section. Parking price at the pier has gone up: $80 for the five night cruises. We parked near the gate and moved our luggage over to the porters then went through security and into the Platinum/Diamond members holding area for accelerated boarding onto the ship. We left home at 10am, arrived at Bayonne around 11:30am and were aboard by 12:30pm! We met up with Kim and Steve around 1pm in the Windjammer and made our plans for Portofino's for Monday night at 6pm. (We wanted 7:30pm, but couldn't make it work) We spent the balance of the day poolside, doing the muster drill, watching the pass under the Verrazano Bridge (always a heart stopper) and just reveling in the fact that we were all on a cruise!!! That night's entertainer, a comic writer from SNL, had us in stitches! (his adult act later in the week was even better) Diane and I and Steve and Kim had a great time in the disco! Our first day at sea (Monday) began, for Diane and I, with a massage at 8am. As usual, this was the perfect start to our cruise! Diane and I both napped after the massages till around noon, then we went to the main dining room for a wonderful lunch. The day was simply gorgeous... very warm in the low to mid 80s and the Atlantic was very calm. We mostly sunbathed all day with Steve and Kim. 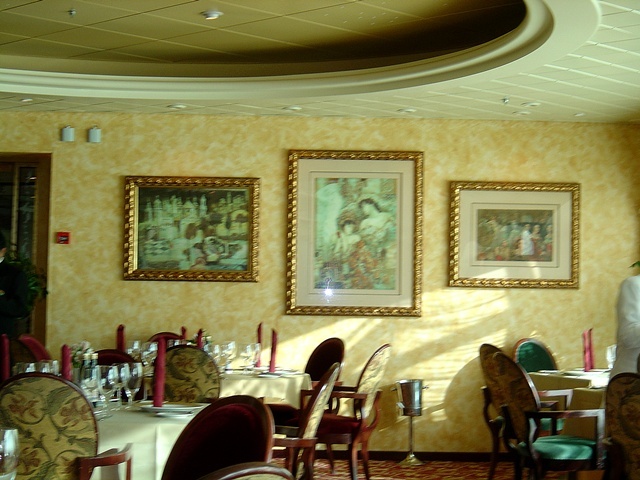 Later we had dinner at Portofino's which is always worth the surcharge. (especially for the unheard of price of $20/person) If you cruise on RCCL and skip Portofino's (assuming there's one on your ship), you've made a huge mistake. Later we saw the RCCL song and dance production "Fast Forward" which featured some of the same singers we saw last year. This year there seemed to be some sound problems... the one main singer's voice kept fading out. 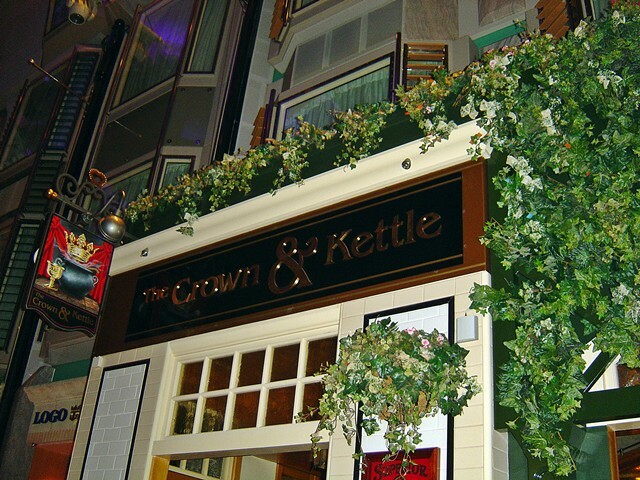 Portofino's specialty restaurant. Do it! Our first day in Bermuda (Tuesday) we bought the Bus/Ferry passes for $20/person for two days. This extremely cheap pass gets you unlimited transportation all over the island using their pink busses and high speed ferries! 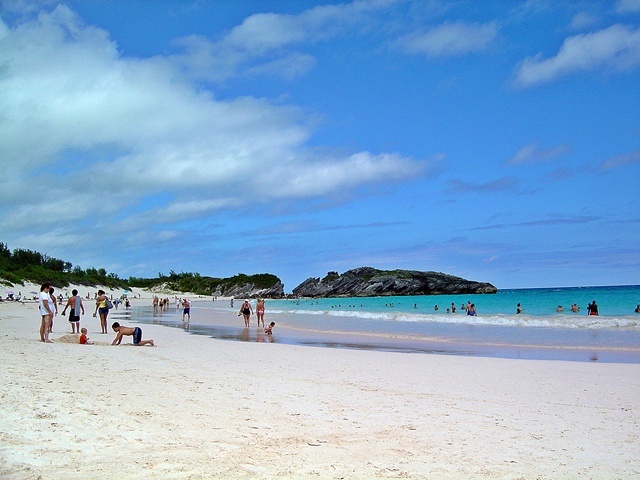 This being our third trip to Bermuda, we decided to try to see more of the island then just the beautiful Horseshoe Bay beach. So, right outta the Dockyard (aka King's Wharf) we took the high speed ferry to the far east side of the island, called St. George. We disembarked and walked about the quaint town and perused the stores and checked out the Episcopal church (dating back to the 1700's) and it's adjacent cemetery. Now... where did we leave the girls??? We then hopped the #6 bus down to the light house then joined the #1 bus to the Hospital to rendezvous with the #7 bus to the beaches. This took about two hours. Since time was of the essence (we had a Sunset cruise planned for 6pm) we decided to forgo all the other beaches we hoped to visit and go directly to the always gorgeous pink sands and turquoise waters of Horseshoe Bay. (One of these days we'll do Warwick!) After a few hours there, we climbed the hill back to the bus stop and boarded a "Special" #7 bus with direct connection to the Dockyard (nonstop)! How did we ever manage that? Horseshoe Bay... pink sand and incredible rock formations! Our sunset catamaran cruise was wonderful. Hosted by Captain "Smitty" (not at all pirate like or even an old salt... just a young Bermudan native who looked like he'd be just as comfortable catching waves in California) who told us a brief history as we sailed away from Explorer towards Hamilton. There was complimentary rum punch served (constantly) which made the whole event very relaxing. The skies were wonderful at sunset. Later, we popped back into Explorer around 8:45pm and ate dinner in the Windjammer so that we could get back down to the port's carnival where locals sell their wares and where there are exhibitions of juggling and native Goombay dancers. Kim and Steve headed back to the ship, and we had a drink in the bar at the port (where service is very slow). 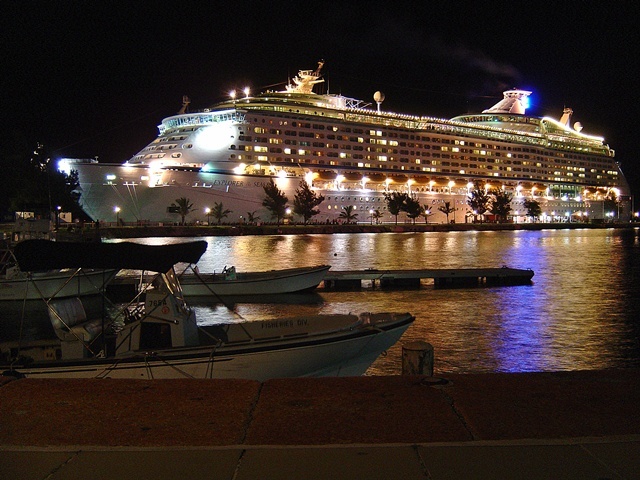 Explorer at night, King's Wharf, Bermuda! Our second day in Bermuda (Wednesday) was also gorgeous, but Diane and I slept in too late to accomplish our original goal of shopping in Hamilton and heading for Horseshoe later... so we decided to forgo Horseshoe and head to Hamilton (the capitol) instead on another ferry. I was very glad we did! This neat and clean city had so much to offer! We only had a few hours but we made the most of it visiting a tiny museum on Queen's street and an adjacent park. We shopped in a few stores and got some cool things for the friends and family back home. There were two ships in port: an NCL (the Crown?) 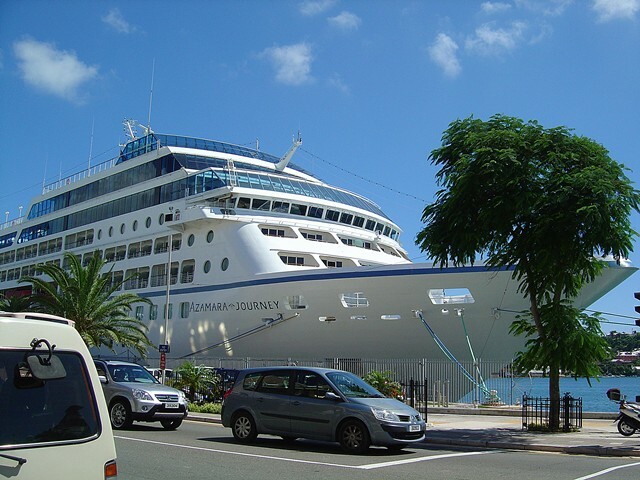 and Azamara Journey (a Celebrity subsidiary that does cruise adventures on small ships). 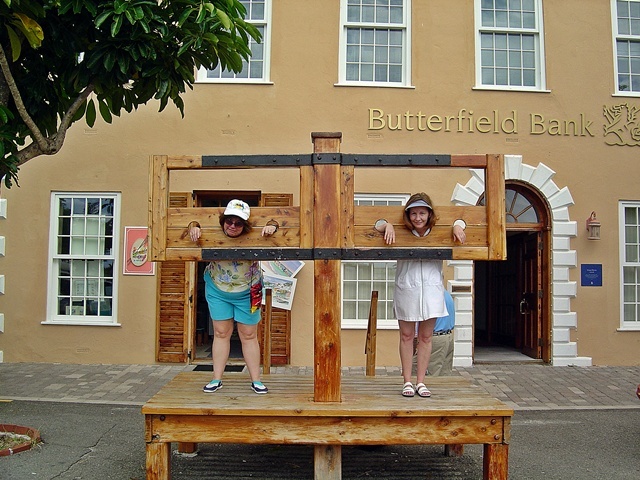 We both decided that our next trip to Bermuda, we'd check out more of the sights in Hamilton. 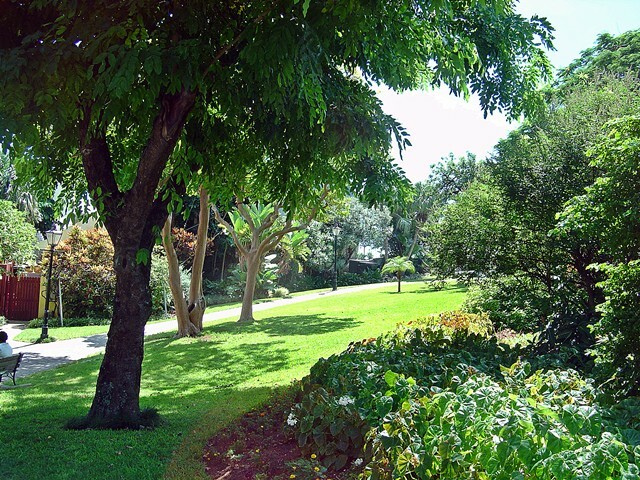 Beautiful park near the Historical Museum, Hamilton, Bermuda. Bye, Bermuda! 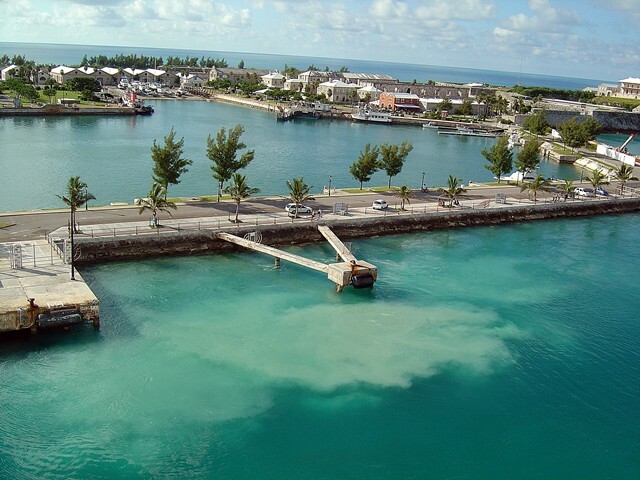 Departing King's Wharf, Bermuda. Explorer's thrusters kicking up sand under the water! Our final day at sea (Thursday), we slept in, nursing yet another hangover. The day started out dreary and a little sprinkly but improved somewhat as the day advanced. Around 5pm, we saw the new ice skating show, "The Four Seasons" which was, as usual, an incredible production. (they actually made it snow real snow during the winter segment) That night we got our suitcases all packed and out the door and got our tips to the ever wonderful Gerry (who got teary eyed when we gave him a gift in addition to an above normal tip) and to Lydia and Clint and the very polite Head Waiter (whose name escapes me). The four of us continued to party at the bars, and I took one more stab at the Casino. I played a Video Poker machine with $20 worth of quarters and kept trying for four of a kind (any kind) betting the maximum of $1.25 per bet. I got down to about $3.75 and hit four aces (!) which won me $200 getting my roulette losses back to me! Carrying 800 quarters around in two buckets was a first! 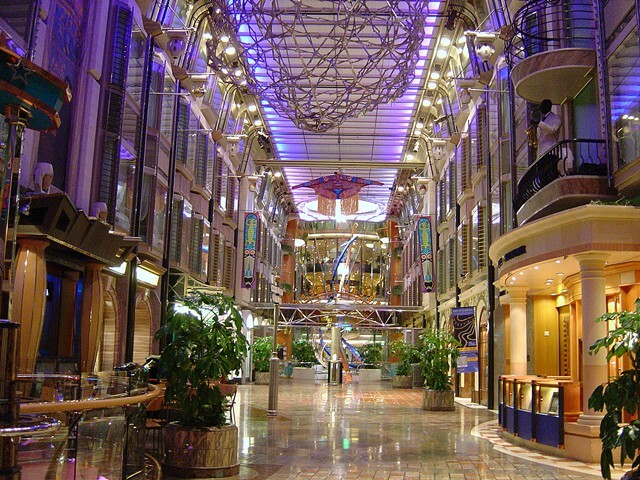 Later, we walked the empty ship (most of the passengers having gone to bed). We walked to the bow and marveled at the Milky Way and Diane and I saw an amazingly bright meteor fireball. Kim decided to head to bed and Diane went to bed a little after this and Steve and I roamed around drinking until we realized we had to be up in just a few hours to get off ship! Disembarkation went very smoothly... here the port has improved immensely. We were off ship by 10am. Unfortunately, an unrelated traffic jam on 440 and the connection to the NJ Turnpike had us crawling out of Bayonne for over an hour. This has never happened before when leaving Bayonne so we were kinda surprised. We were home, with lunch picked up on the way, by 1:00pm. Steve and Kim got home a few minutes after. This was a thoroughly enjoyable trip! It was a reunion for the four of us and Explorer since, four years ago, we'd all cruised for the very first time together on this particular ship. Every cruise that includes our friends, Kim and Steve, is always full of great times and memories... having them as our close friends (and neighbors) is awesome. We love them very much.